The Allen County Public Library in Fort Wayne will hold a free class, "Jumping Off Points: Getting The Most Out of a Single Record," on Saturday, September 14 from 10 to 11 am in the library's Meeting Room A. It's all too easy to glean the basic information from a record without examining it to see what it can reveal beyond the obvious. Dawne Slater-Putt will dissect a death record to show where it can lead the researcher beyond just the decedent's date and place of death. This is a free event, the last session in the "Family History Fundamentals" series. To register, please call (260) 421-1225 or e-mail Genealogy@ACPL.Info. 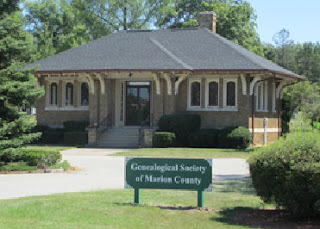 The Genealogical Society of Marion County will meet on Saturday, September 14 from 1 to 3 pm at the Franklin Road branch of the Indianapolis-Marion County Public Library. Ken Nowlan, CG will present a program, "Making Sense of DNA: How It Can Assist Genealogical Research," which will focus on making DNA analysis more understandable to genealogists. This is a free program, open to the public. The Society of Indiana Archivists will hold their Fall Workshop on Friday, October 4 from 9 am to 4 pm at the Indiana State Museum (650 W. Washington St., Indianapolis IN 46204). The theme of the workshop is "Artifacts for Archivists: Tricks of the Trade from Museum Professionals." Gaby Kienitz, head conservator of the Indiana State Museum, and Sally Childs-Helton, Butler University archivist, will unravel the mysteries of how to care for and make accessible the kinds of artifacts that almost every cultural repository contains. They will cover cleaning, storing, exhibiting, accessioning, cataloging and more. The workshop will also include a tour of the Indiana State Museum stacks and conservation lab. Registration for the workshop is $35 for SIA members, $45 for non-members. The workshop is limited to 60 people and lunch is on your own. Participants may be eligible for ACA credits and LEUs. To register, or for more information, see http://inarchivists.org/workshops/files/2013FallWorkshop.php. Questions about what subjects will be covered at the workshop? Contact Sally Childs-Helton - phone (317) 940-9265; e-mail schildsh@butler.edu. The Allen County Public Library in Fort Wayne will hold a free class, "Public Member Trees on Ancestry.com," on Thursday, September 12 from 2 to 3 pm in the library's Meeting Room A. Public Member Trees are one of Ancestry's most popular features, yet also the most maligned. John Beatty will show you how Public Member Trees can really help you. For users of Ancestry Library Edition, you will see what tools there are for evaluating the trees and what red flags to look for when the evidence seems inconsistent. For individual subscribers to Ancestry, you will discover specific ways of adding value to the Trees, making them more useful for all users. This is a free event, the last session in the "Beyond Ancestry's Leaves & Branches" series. To register, please call (260) 421-1225 or e-mail Genealogy@ACPL.Info. I am creating a genealogy research project regarding the Rodarmel family of Knox County Indiana, by using Apple Family Tree. They have lived in this country since the early 1800's. Can you help and/or can I help you. The Allen County Genealogical Society of Indiana will meet on Wednesday, September 11 in Meeting Room A of the Allen County Public Library in Fort Wayne. Curt Witcher will present a program, "What's Old Is New Again - The Latest From The Genealogy Center." The meeting is open to the public at begins at 7 pm (gathering time is 6:30 pm). to service the Grants Project. normally about 8-12 applications during November and December. February. This submission may be done electronically. three checks to those groups. Some checks may need to be mailed. hours per year, and the position does not require Indiana residency. Training will be provided by the previous Chair. The Genealogical Society of Marion County Library will hold a grand opening on Saturday, September 7 at 11 am at Memorial Park Cemetery, 9350 East Washington St., Indianapolis. The library recently moved into its new space after many years at Crown Hill Cemetery. The building at Memorial Park Cemetery was remodeled thanks to the cooperation and support of Flanner and Buchanan Funeral Centers. The new location means expanded hours for the library - Wednesdays from 9 am to 4 pm and the 1st and 3rd Saturdays of the month from 9 am to 4 pm. The library is now a FamilySearch Affiliate Library, meaning the public will be able to order microfilm directly from FamilySearch for viewing at the GSMC library. There is also Wi-Fi for free Internet access. Please RSVP for the grand opening - e-mail Info@GenealogyIndy.org. My maternal gr-gr-grandfather was Harvey Harlow. Harvey was in Seymour, Carr Township, Jackson County, Indiana, in the 1870 Census with my great grandmother Ona May Harlow and her brother Alvah. This I know for sure is my family. I am looking for any information on that family, and what happened to Harvey and his wife, Ann, after the 1870 census, and, of course, more on their ancestors. I am happy to share the forward information or you can find it on my ancestory.com site. These are free databases - no membership is necessary to view them. They are indexes of soldiers' discharge papers that are on microfilm at the Monroe County Public Library in Bloomington. These databases are courtesy of Randi Richardson. The Indiana Genealogical Society now has 1,116 databases in the Members Only area. Each of Indiana's 92 counties has at least 4 databases. Allison Fredrickson, genealogy and local history librarian at the Jeffersonville Township Public Library in Clark County, will discuss the library’s Indiana Room collection at the Thursday, September 5 meeting of the Southern Indiana Genealogical Society. The meeting will begin at 7 pm in the Strassweg Auditorium of the New Albany-Floyd County Public Library (180 W. Spring St., New Albany, Indiana). For more information about the Southern Indiana Genealogical Society, please visit http://www.rootsweb.ancestry.com/~insigs/index.html. The Hamilton East Public Library in Noblesville will hold a free workshop, "Thinking Outside the Box," on Saturday, September 21 from 9:30 am to 12:30 pm in the library's genealogy classroom. You'll learn how to step back from your genealogy research and use unlikely or little-used genealogical resources to find new information on an elusive ancestor. This workshop is free but registration is required. Register online through the events calendar at the library's website or by phone (317) 776-6939. For more information, please contact the library's Indiana Room - phone (317) 770-3206. The Northwest Indiana Genealogical Society will meet on Saturday, September 21 at 10 am at the Valparaiso Public Library. Kay Lynn Mathews will present a program on how to use the FamilySearch website to find photos and documents of your family, and how to organize those records to share with others. The Northwest Indiana Genealogical Society represents the interests of Lake County and Porter County. This meeting is free and open to the public. 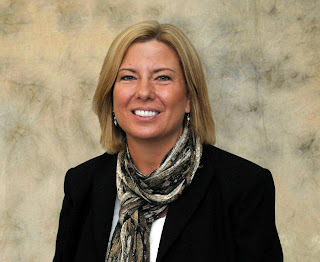 At the August board meeting, the Indiana Genealogical Society officially welcomed Lisa Swanson Ellam of Granger, Indiana as the At-Large Director. IGS has a nationwide membership comprising 44 states, and Lisa will be the primary service provider for those members who are outside the state. Lisa is a graduate of Indiana University – South Bend and is the Coordinator for the Office for Postdoctoral Scholars at the University of Notre Dame. She is also a director on the board of the South Bend Area Genealogical Society and a member of the William Tuffs Chapter of the Elkhart County DAR. She maintains a blog for her own personal genealogy, titled The Faces of My Family (http://thefacesofmyfamily.blogspot.com), as well as the society blog for the South Bend Area Genealogical Society (http://www.sbags1.blogspot.com). Her Indiana research interest lies in Wabash, Grant and Randolph counties. In addition to speaking on various genealogy topics in the St. Joseph County area, Lisa has also completed the two part Cemetery Restoration and Preservation classes through the Indiana Department of Natural Resources (DNR) and enjoys maintaining old, abandoned cemeteries in Wabash County. Looking for any information on the Barnes family. My line is to Truman Barnes, below. Ancestors: David Barnes died 1850's (possibly 5 Nov 1854), Jay County; His son: Truman b. ~1828 d. 28 Sept 1894, Jay County; His son: Erastus b. ~1825 d. 5 Oct 1862. Thanks to all who responded to the recent query we posted about an obituary that mentioned a "Metholene County" in Indiana. They were able to determine that the people were in fact from Bartholomew County, Indiana. It would be interesting to figure out where the "metholene" part came in. Query: Ever Heard of This County? I have been researching a family and one of the obituaries says that a gentleman and his first wife were married in "Metholene County, Indiana." I can't find a current county by that name. Was there ever one by that name, and if so where was it? UPDATE FROM IGS: Sue has now located the people - they were actually in Bartholomew County, Indiana. Query: Datee Ballinger, Central Indiana?